Portraits used for Christian meditation have been around almost since the beginning of Christianity. This is, of course, expected. Just as the Almighty God chose to come as the Word and to speak to us, so Jesus Christ is the “image of the invisible God” (Colossians 1:15). To see Jesus Christ is to see God. This is a simple and profound theological statement. The principle of icon making is to create pictorial expressions of the teaching of the Church, representing key events of history and indicating their meaning. Both the form and the content of icons are designed to transmit the revelation of the divine to the human. The means of this transmission is through the practice of contemplation. Imaging is an important part of our life. Human beings think with a combination of words and pictures. Imagery can have a unique power to move us deeply, as advertisers are well-aware. Consequently, for Christians to gaze upon an icon, a visual symbol of the deepest truths and figures of our faith, is to engage in a special way with God. This is especially true when we consider that the Holy Spirit is present with us as we offer our devotion to God. The practice of icon meditation is not difficult. First one must select an object for meditation and adoration. The icon should not be so small that it would be hard to look at for a while. If you are easily distracted, do not choose one too large or with too many details. Put the icon in a place where your eyes can comfortably spend twenty minutes or more with it. Make sure you have appropriate lighting. Some prefer to light a candle nearby as the flame seems to communicate Spirit as it illumines the icon. Some prefer to begin their time of meditation with an opening prayer of invitation. Then we simply set our eyes and minds on the picture, and beyond the picture to the event or figure(s) represented, and beyond the events and figures to God. 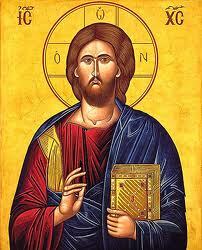 We gaze, using the icon to focus our simple worshipful intention. When our minds wander, we simply note our awareness of the distraction and return to the icon. The point of icon meditation is not aesthetic appreciation. There may be a moment of this, especially as we are starting with a new icon, but icon meditation should move beyond artistic thinking to spiritual presence, for the icon itself is not created simply as a representation of deity, but also as a vehicle of our participation in the divine life. Some people repeat an appropriate prayer phrase as they look upon the icon, but it is not necessary. It is enough simply to watch and be present. It may help, if you return to a particular icon again, to learn about the symbols represented in the various elements of the painting (clothing, colors, words, poses and so on). A little bit of education can help you receive the most from this pictorial statement of Church teaching. When you finish your time of meditation, you may wish to spend a moment of recapitulation, briefly noticing what was present in this encounter. You may also wish to close your time with a prayer of gratitude or a benediction. Then return again. Just as using a given phrase in prayer over time deepens our ability to move through that phrase into prayer, so also making friends with a particular icon can facilitate relationship with God.